Jacks O' Diamonds, is a 3 piece power trio delivering blues and blues/rock music with attitude and razor tight precision. Along with their own hard hitting versions of songs by blues legends including, but not limited to BB King, Eric Clapton, Jimi Hendrix, The Allman Brothers, Junior Wells, Stevie Ray Vaughan, Rory Gallagher...the list goes on and on..., they also have created a stir with their own original compositions including "This Evening”, “Told ya Once”, “Devils Eyes”, “Dusty Man”, “I’m Cuttin’ Out”, and several others all different and exciting and all layed down with that Signature Jacks Style. In 2006 Jacks O’ Diamonds released their first full length album entitled “Find Something New” to rave reviews. The name of the game for this band is POWER. Beginning with the slashing guitar licks of Josh Allen, riding a Thunderous Wave of Rhythm this is a band you don't want to miss seeing. MOVING PICTURES is New York City’s Premiere RUSH Tribute Band comprised of three talented, technical musicians that consider RUSH to be the unsurpassed band of four decades. Performing the most difficult and exciting music ever written, Moving Pictures achieves the essence and style of Rush. Moving Pictures was formed to replicate the music of Rush to near perfection with an energetic spirited performance to appeal to the many dedicated Rush fan-base. Don’t miss a change to see Moving Pictures on stage! 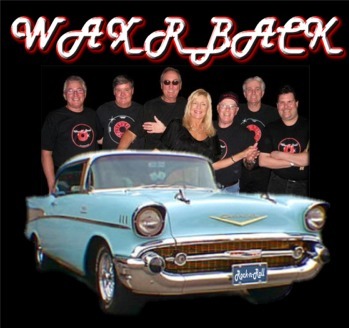 Hop in your Rock-n-Roll time machine and take a stroll down memory lane with the WAX R BACK, the greatest Doo-Wop Band in New York...performing your favorite oldies, 50s and 60s with a few party surprises! The WAX-R-BACK group started as a sing-a-long in the mid 70's. Charlie Arnemann, who picked up the basics of guitar playing in the Army, would play oldies; his wife Diane and many of their friends would take turns singing and harmonizing. Jeff Dady, now the lead singer and Joe Stephan, both historians of music, joined to sing in all the DOO-WOPS they knew at Anglers Clubs and parties with rock and roll twists. In the 80’s the group name was born: "Wax" was what 45's were mastered from "Wax-R-Back" became their logo. Over the years Charlie Howard, Doris Dady, Barbara Bradford and Fran Gill would give memorable performances and prove to be the heart beats of the band and will always be missed. Guy Long joined the band performing bass and lead guitar in the 1990s. Guy’s singing and band career stemmed from, very interestingly, the Disco era. In 2003, Tommy O’Reilly and his Motif would pave the way for excellent keyboarding and Sean Minardi, an accomplished rare singing drummer would make the band complete. The Wood Vibrations are a high-energy acoustic party band, covering music from all eras, from the big Top 40 hits of today to popular songs of the 60's to the 2000's. The band's goal is to provide the absolute best entertainment and musicianship for your wedding, corporate event, party, or venue. Welcome to the BACK TO THE 1980s Experience. An entertaining six-piece group with costume changes recreating the sights, sounds and love of the 1980s fronted by both female and male vocalists available for clubs, bars, parties, weddings and corporate events.